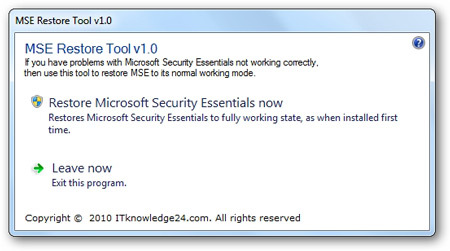 MSE Restore Tool is a free portable tool that allows you to restore Microsoft Security Essentials (MSE) to the first-time-run state with one click. Just run the tool and click Restore Microsoft Security Essentials now. It will now restore Microsoft Security Essentials (MSE) to the first-time-run state.